Sandspit Amusement Park is the perfect destination in Cavendish for family thrill-seekers. Awarded a Trip Advisor Travellers’ Choice Award every year since 2014 and named one of the Top 10 Best Amusement Parks in Canada in 2016 and 2017, Sandspit consistently delivers high-quality fun for the whole family to enjoy. You’ll need nerves of steel to climb on board the Cyclone rollercoaster at the Park, which is the largest in Atlantic Canada. It will have you at the edge of your seat as it dives through three adrenaline-pumping drops, before zooming through two corkscrews and then rolling into the station at full speed! Nerves are still intact? Soar off into space with the Cliffhanger. 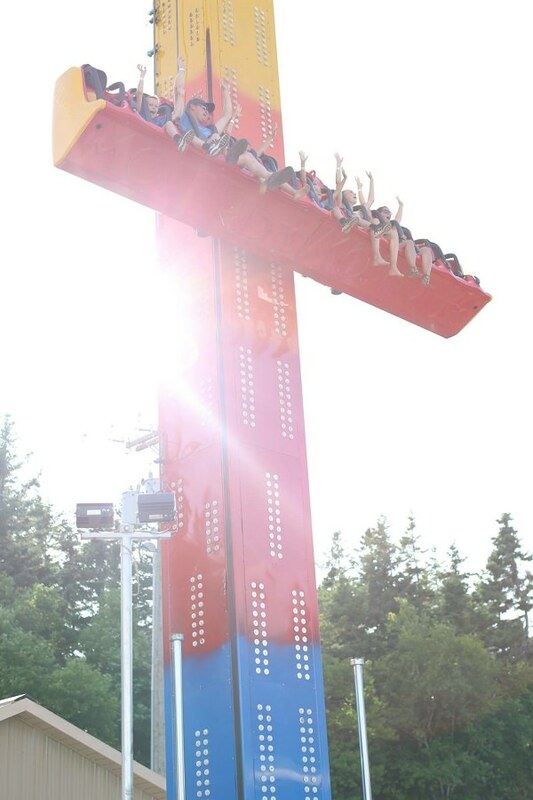 Riders are launched 52-feet into the air while offering spectacular views of Prince Edward Island’s surrounding landscape, if only for a moment, before getting a taste of weightlessness with the 2.3 g-force on the way down. After catching your breath and having your feet firmly back on solid ground, check out the half kilometre double figure eight track that features all the twists, turns, bridges and tunnels your family will be able to handle. Sandspit even has double rider go-karts, so the whole family can participate. There are tons of activities just for the little ones too! Fly your own helicopter or airplane, race to the scene in a firetruck or police car, ride on the carousel or bucking bronco, or just dive right in to the ball pit. And for those seeking a break from the adrenaline rush, there’s plenty of old-fashioned amusement park games. These games include Frog Bog, Roll Down, Shooting Gallery and Can Crusher. There’s also a Skee-Ball arcade located in the ticket building, and all games have great prizes! Our insiders say Sandspit will to whisk you off on an epic adventure and by the end of the day you’ll have pocketed memories with loved ones to last a lifetime. Slide and Ride XL passes allow unlimited entry to eight fun family attractions. Attractions include: Shining Waters Family Fun Park, Sandspit Amusement Park, Mariner’s Cove Miniature Golf, Ripley’s Believe it or Not! Odditorium, Wax World of the Stars and Cavendish’s newest adventure, Cavendish Beach Adventure Zone, plus receive a $10 rechargeable play card from Yippee’s Playcade. Pre-purchase online and save five percent.